"Unleashing the power of female entrepreneurship can have a dramatic effect on a country’s economy. The research clearly supports the assertion that key things need to be fixed in order for female entrepreneurship to survive and flourish." GEDI’s women’s entrepreneurship index – the Female Entrepreneurship Index – measures the development of high potential female entrepreneurship worldwide. 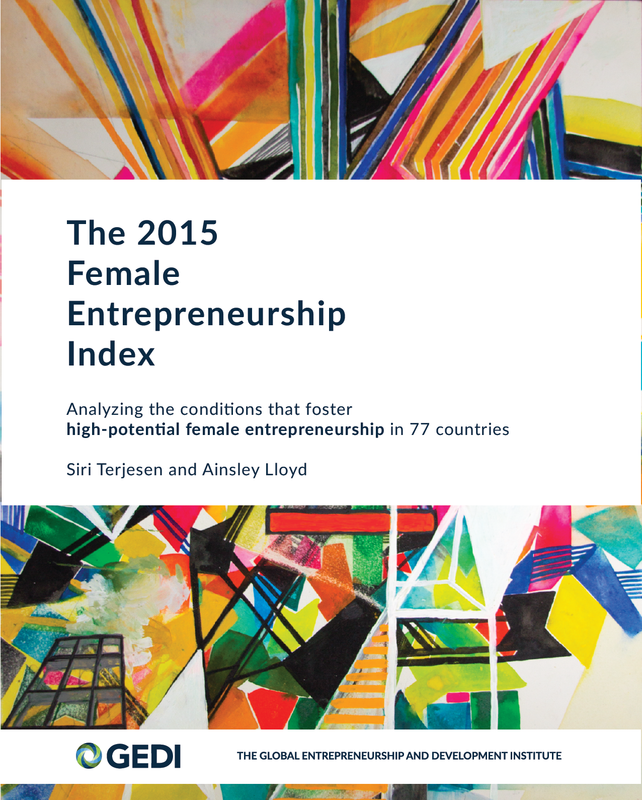 Defined as “innovative, market expanding, and export oriented,” this gender specific Index utilizes GEDI’s unique framework, methodology, and global approach in order to capture the multi-dimensional aspects of entrepreneurial development. Now in its third year, the index was launched at the 2013 annual meeting of the Dell Women Entrepreneurs Network (DWEN) and covered by Forbes Magazine. Download the 2015 report here, including full scores, rankings, and regional analysis for our 77 countries. Like the Global Entrepreneurship Index, the FEI framework pairs together individual-level and institutional-level variables into pillars. These contain three main sub-indices that measure the quality of: 1) the entrepreneurial environment; 2) the entrepreneurial eco-system; and 3) women’s entrepreneurial aspirations. GEDI’s proprietary methodology captures the dynamic, inter-related nature of the pillars. Data is sourced from internationally recognized datasets including the Global Entrepreneurship Monitor, the International Labor Organization, the World Economic Forum, the World Bank, UNESCO, and United Nations Development Program. Data collected for individual-level variables are disaggregated by gender. For institutional variables, data points highlight issues relevant to the development and growth of female entrepreneurship.